Mizensir, the fragrance line of perfumer Alberto Morillas, has launched Lovely Alba, a new fragrance. Lovely Alba had to have the lightness, the sweetness and the innocence of a fragrance for the young ones while offering the intensity and persistence of an Eau de Parfum for the older ones. And everything is in place. In the grace and delicacy of Neroli supported by Orange Blossom, in the transparency and freshness of Paradisone. The Iris concrete offers its powdery elegance, Benzoin and Vanilla their caressing sensuality. A fragrance that has not quite left childhood but is already looking towards the future. 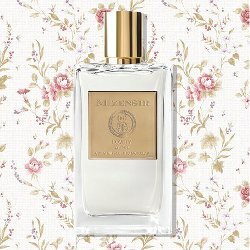 Mizensir Lovely Alba is €190 for 100 ml Eau de Parfum. A casualty of google translate? Never heard of Mizensir, but it all looks very satisfying. No doubt only available across the pond. Possibly…I do not know what they do to translate. Aedes has their candles, but not the perfumes.